It's no secret that the fashion trends of the early 2000s are hitting it big right now. From cropped tees to Juicy Couture sweatsuits, we've seen looks emerge over the past few seasons that we thought we had safely locked up in the past, never to be seen again. Leave it to Kardashian, however, to have us re-considering the throwback looks, wearing a golden vintage Balmain mini dress and heels to this weekend's nuptials. Stunning as Kardashian might have looked in her after-hours-approved outfit, it was her choice of accessory that had us re-playing her Snapchat video where she shared a selfie mirror video before the ceremony. While her sleek iPhone was in her right hand, her left held a giant cell that looked as though it were from the late 1990s, gigantic and bulky as we remember. This one, though, was no electronic device. In fact, it was a $5,695 crystal-covered clutch by Judith Leiber that we hope becomes a trend in and of itself. 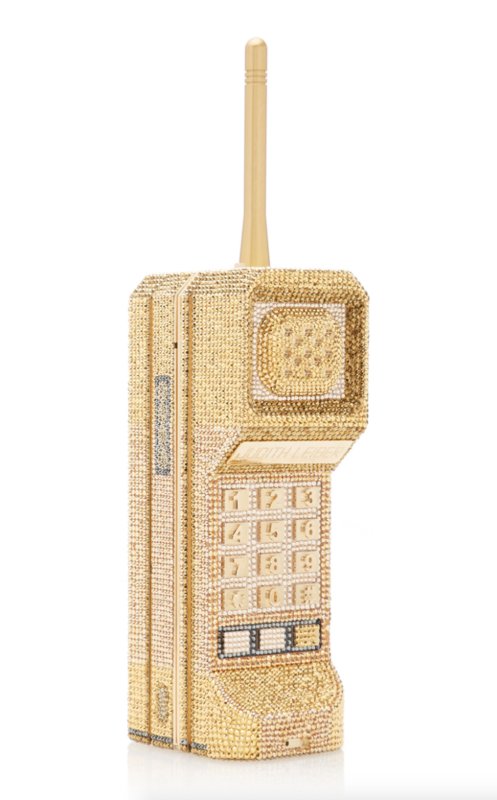 After showing off Kanye's black tux and her own golden dress, Kim raises her accessory, saying, "I've got this old school phone purse..." And, immediately following — because a bag like this can't possibly get enough screen time, Kim shares another video walking down the hall, zooming in on the sparkly bag, saying, "Look at this phone you guys." If only our actual cell phones in the '90s looked like this one.